Florist Pourquoi pas fleurs we’re proud to present you with our extensive collection of beautiful flowers. All of our bunches of flowers are expertly created by hand, using only the finest blooms, and delivered as promised, with a smile. And with over 20 years of flower delivery experience you can rest assured that with florist Pourquoi pas fleurs your chosen gift is in safe hands. Our Pourquoi pas fleurs promise guarantees your bunches of flowers will stay fresh for five days - just one of the reasons our customers have voted us ‘good to excellent’ on service, choice and quality. Anniversary, birthday, we pride ourselves on our quality, with beautiful flower bouquets. 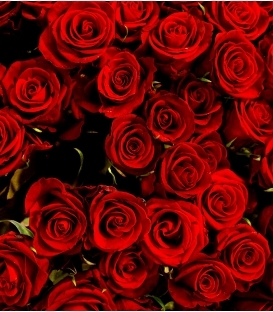 Think of beautiful bunches of flowers and stunning flower bouquets and we hope you think of Florist Pourquoi pas fleurs. We understand just how important it is that your choice of gift is delivered in perfect condition, because you can’t be there in person. We’ve focused on providing only the most beautiful fresh flower bouquets, each carefully created by hand of experienced florists, and backed up by excellent customer service. It’s a winning combination that goes on prompting smiles of delight every day, all around Montreal. 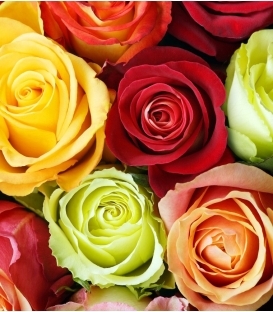 Sending flowers is easy withour florist. We are famous for delivering bunches of flowers all over Montreal. Order online today for next-day delivery. 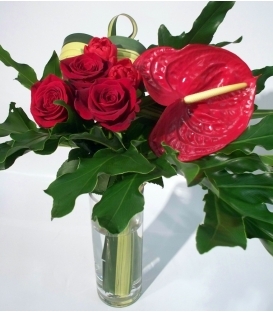 Valentine V50 Modern bouquet with red roses, tulips and an red anthurium from South America designed with exotic foliage such as phylo and pendanus leaves. 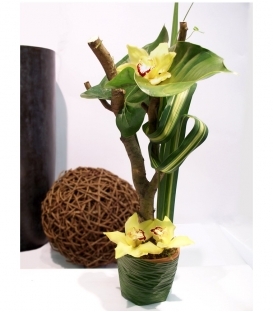 P18 Zen O Minimalistic floral design composed of green cymbidium orchids from Asia. 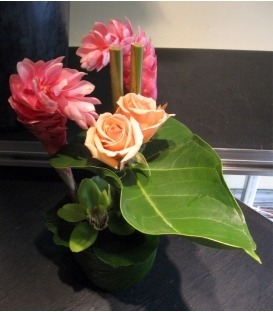 The arrangement is designed with Anthurium leaves, pendanus foliage and a curly willow branch. The flowers are inserted in a terracotta pot filled with humid floral foam wrapped with a coco leaf, giving it a tropical feel. 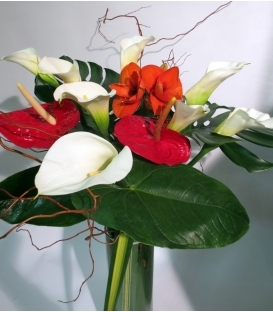 Valentine V75 Modern bouquet with orange anthurium, red gingers and white callas from South America designed with exotic foliage such as coco and anthurium leaves. Valentine V175 Modern bouquet with white calla lilies, amaryllis, anthurium designed with exotic foliage such as pendanus monstera, anthurium leaves and curly willow branches. Chic and modern arrangement with white flowers from Colombia. 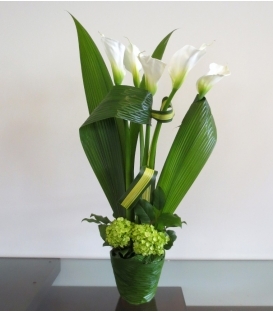 This tall arrangement is composed of wide opened callas flowers. 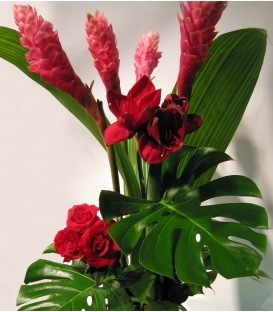 It is stylised with folded tall pendanus leaves and anthurium leaves. The flowers are inserted in a terracotta pot filled with humid floral foam wrapped with a coco leaf, giving it a tropical feel. Valentine V150 Modern bouquet with red amaryllis, pink gingers and red roses from South America designed with exotic foliage such as coco and monstera leaves. Valentine V100 Modern bouquet with red amaryllis, pink gingers and red roses from South America designed with exotic foliage such as coco and monstera leaves. 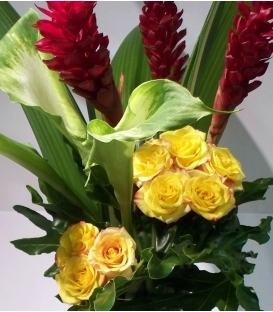 Exotic flowers or seasonable blooms we incorporate the most luscious foliage in each one of our arrangements. Every bouquet is handmade with love and beautifully packaged ensuring that each arrangement will be the freshest, most innovative gift for loved ones (or yourself!). Each one of our unique arrangements is personally created in one of our Montreal shop by our specialized designer. Our style is elegant design with a contemporary twist. How to send flowers to a hospital? 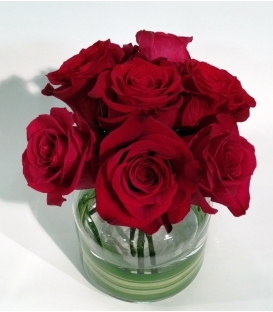 How to send flowers to a hotel?